His father was a free-thinker and agnostic who quoted Voltaire and had a volatile temper. Later in life he was to become a Roman Catholic and a Republican. The elephant is also a recurring image in Dalí's works. It first appeared in his 1944 work Dream Caused by the Flight of a Bee around a Pomegranate a Second Before Awakening. The elephants, inspired by Gian Lorenzo Bernini's sculpture base in Rome of an elephant carrying an ancient obelisk, are portrayed "with long, multijointed, almost invisible legs of desire" along with obelisks on their backs. Coupled with the image of their brittle legs, these encumbrances, noted for their phallic overtones, create a sense of phantom reality. "The elephant is a distortion in space," one analysis explains, "its spindly legs contrasting the idea of weightlessness with structure. "I am painting pictures which make me die for joy, I am creating with an absolute naturalness, without the slightest aesthetic concern, I am making things that inspire me with a profound emotion and I am trying to paint them honestly." Salvador Dalí, in Dawn Ades, Dalí and Surrealism. DALI - The Hard and the Soft. Sculptures & Objects. 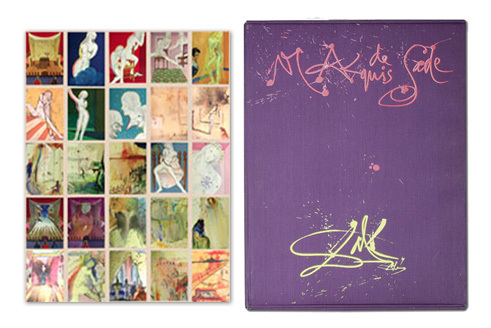 Catalog of the three-dimensional work of Dali, by Robert and Nicolas Descharnes, published by Eccart edition, France in 2003, 285 p.
2016 Jean-Luc Pouliquen, Dali, son mécène et le président, CIPP. 2012 Thierry Dufrêne, Double image, double vie, Paris, Hazan, 280p. 2008 Jean-Pierre Thiollet, Carré d'art. Barbey d'Aurevilly, Byron, Dalí, Hallier, Croissy-sur-Seine, Anagramme éd. 2007 Astrid Ruffa, Philippe Kaenel, Danielle Chaperon (éd. ), Salvador Dalí à la croisée des savoirs, Paris, Éd. Desjonquères. 2006 Jean-Gabriel Jonin, Jours intimes chez Dalí, Rafael de Surtis-Editinter.